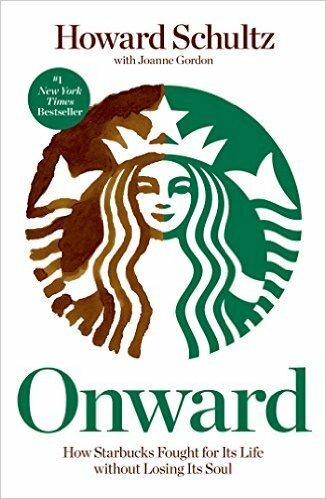 In lieu of my usual Brand Book Bites format, I wanted to share my favorite excerpts from Onward: How Starbucks Fought for Its Life without Losing Its Soul, the book Starbucks CEO Howard Schultz wrote in 2012 to memorialize the remarkable turnaround at his company after he returned to the helm in 2008. I recently re-read the book (for purposes that will become clearer later…yes, that was a teaser) and was struck by the way the company’s recovery was driven by a singular, clear, and focused commitment to the Starbucks brand. It is in fact, perhaps, one of the best demonstrations of the “brand-as-business” management approach in action. With brand as business, the brand is used as the central organizing and operating idea of the business. My first book, What Great Brands Do, covers the seven brand-building principles that comprise the brand-as-business management approach. It shows how a range of companies use brand as business in a range of situations to increase profit margins, inspire true customer loyalty, and build sustainable businesses. As I took a fresh pair of eyes to Onward, I realized that brand as business is a valuable, effective approach when an organization has suffered a blow or experienced a major setback. Turnaround leaders can use their brand as the engine, fuel, and compass to right the ship. Although Schultz doesn’t use these exact terms to describe his and his company’s efforts, it’s clear they implemented the brand-as-business approach. I made two quick decisions… First, we would retrain 135,000 baristas in espresso beverage preparation, from pouring a perfect shot to properly steaming milk…Second, I committed to hosting a 2008 leadership conference for our 8,000 US store managers and almost 2,000 more partners… I did not know how I would justify to Wall Street the millions of dollars it would undoubtedly cost, but I intuitively knew that such a massive gathering, if executed right, would infuse the people who managed our stores with the emotional capital they so desperately needed to reconnect with the company. My second strategic emphasis [of three strategic initiatives that Starbucks would immediately undertake after I become CEO]: We would reignite the emotional attachment with customers. Unlike other retailers that sold coffee, the equity of Starbucks’ brand was steeped in the unique experience customers have from the moment they walk into a store. Reinvigorating the Starbucks Experience could provide the meaningful differentiation that would separate us from competitors. [On why they pursued VIA]: To be clear, the goal was not to make a better cup of instant coffee. No. Our aspiration was much higher. And while I might not have specifically articulated this back then, I sensed that Starbucks had the potential to once again create a new product category so that, one day, coffee lovers who once would not have dreamed of drinking instant coffee would drink ours… Going against conventional wisdom is the foundation of innovation, the basis for Starbucks’ own existence. Now, we once again had a rare opportunity to create a new category of beverage. [On a possible relationship with World of Warcraft’s parent company, Blizzard Entertainment]: Stephen and Adam debated the pros and cons of a Starbucks-Blizzard partnership. It had undeniable potential to make Starbucks relevant to a new demographic, young adult males, and drive massive numbers of new customers into our stores, giving us an almost overnight sales boost. So very, very tempting. But by the time the plane landed, they had agreed with what Michelle and I had also concluded: World of Warcraft simply strayed too far from Starbucks’ core. Again, this was not an easy choice given the financial and competitive pressures Starbucks was under. A manager at one of Starbucks’ institutional shareholders [called me to say], “We know you’re under tremendous pressure, and we feel very strongly that this is the time to cut the health-care benefit.” This was not the first time I’d been pressured to eliminate or significantly reduce our partners’ health-care coverage. Doing so would have an immediate effect on profitability, but at much too high a cost. The very foundation of Starbucks, our true competitive advantage, is our culture and guiding principles. That reservoir of trust that we have established with our people had already been drained to some degree. This would sap it dry. While the company would have to ask our people to share in the rising expenses of health care, eliminating it was unthinkable. OUR ASPIRATION To become an enduring, great company with one of the most recognized and respected brands in the world, known for inspiring and nurturing the human spirit. Seven pillars of the Transformation Agenda: Be the undisputed coffee authority. Engage and inspire our partners. Ignite the emotional attachment with our customers. Expand our global presence. Be a leader in ethical sourcing and environmental impact. Create innovative growth platforms worthy of our coffee. Deliver a sustainable economic model. More than a business plan, the Transformation Agenda gave us all something concrete to believe in.